Col·legi d'Arquitectes de Catalunya. Photo by Jordi Ferrer. Picasso gave a lot to Barcelona—enough to literally fill an entire museum, in fact—but he took a lot from it, too. Here was “where it all began,” from the medieval church art that inspired him to invent cubism, all the way down to his very own name. The artist would joke that even he did not know how many names he had been given. According to Encyclopedia Britannica, he was baptized with 23 family names: Pablo Diego José Francisco de Paula Juan Nepomuceno Crispín Crispiniano María de los Remedios de la Santísima Trinidad Ruiz Picasso. It was in Barcelona that his friends began calling him by his mother’s surname, Picasso. He thought it was “stranger, more resonant” than the others and history has certainly shown that to be true. Walking through the winding alleyways of Barcelona’s Barri Gòtic, you feel the echoes of that famous name everywhere. Carrer d’Avinyo was home to Picasso’s old art college, as well as the brothel that became the namesake for his cubist masterpiece, “Les Demoiselles d'Avignon.” In El Born, the city returned the favor and named a street after him: Passeig de Picasso. Among the countless copycats and street art homages that decorate Barcelona, there is also work by the man himself. Simplified and rushed, the figures on the façade of The Architect College of Catalunya (in Plaça Nova facing La Catedral) are an unmistakable celebration of Catalan culture, drawn to spite the fascist dictator who commissioned them, or so the story goes. Housing one of the largest collections of Picasso works in the world, the Museu Picasso opened in March of 1963, making it the first-ever Picasso museum and the only one to open during the artist’s lifetime. But in a city so richly intertwined with the artist, there are more ways than one to get a taste of the life that the artist led in Barcelona at the turn of the 20th century. Casa Martí, Els Quatre Gats. Photo by Ralf Roletschek. Els Quatre Gats. Photo by María Rose Ferrer. Els Quatre Gats. Photo by Arian Durst. 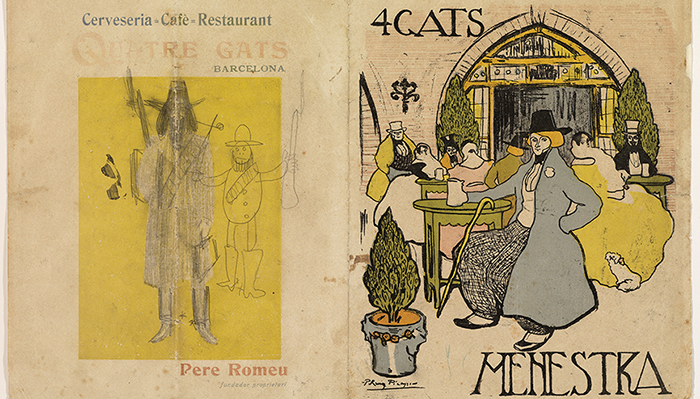 No article about the countless connections between Picasso and Barcelona would be complete without a mention of this famous Catalan café. The hip and bohemian Els Quatre Gats was a regular haunt for the young Picasso, and the location of his first ever solo exhibition. The café was not famed for its food, which was described by a contemporary as “a triumph of hope over substance,” so it was lucky that the aspiring young artist they asked to design the menu and dish of the day poster turned out to be Picasso. Their luck ran short, however, as it closed in 1903, after just six years in business. It wasn’t until 1978 that Els Quatre Gats was reconstructed at its original location on Carrer Montsió and the modern-day reproduction has made every effort to recreate the 1897 original. The menu designed by Picasso during his years patronizing the café can still be seen gracing the covers, and it still survives trading on an arty atmosphere and alternative reputation more than good food. Opened in 1820 in the El Raval neighborhood of Barcelona, this locally famous bar is rumored to have been a favorite drinking place of many famous artists, including Picasso and Ernest Hemingway. What’s more, Bar Marsella hasn’t been redecorated (nor perhaps even cleaned) since it opened nearly two centuries ago. Whether there is any substance to these rumors or if they are just wishful thinking is impossible to say, but it is certain that Picasso enjoyed a few glasses of absinthe somewhere in the city. The beginning of the 20th century saw the great man paint several portraits of people accompanied by the famously strong liquor. Bar Marsella still serves absinthe in the traditional manner, with sugar cubes, a small fork and a bottle of water. The French balance the fork across the top of the absinthe glass, place the sugar on it and drip ice cold water onto the sugar until it dissolves and sweetens the absinthe below. The liquid becomes deliciously cloudy. This “louche effect” marks true absinthe and sets it apart from the various bottles of luminous-dyed vodka you can buy in any corner shop or tourist trap. Picasso last set foot in Barcelona in 1934, after which he lived in self-imposed exile during the Spanish fascist regime. That said, this quintessentially Catalan bar, which didn’t open until 1945, still has a lot to offer someone looking to see the Barcelona of Picasso’s time. The lively crowd that frequent La Plata spill out into the street almost every evening, loudly enjoying wine from the Penedès region (one hour west of the city) and an enviable vantage point down two streets deeply connected to Picasso. The first, Carrer de la Mercè, was the street where Picasso’s family first lived after moving to the city in 1895. Although the bar is at number 28 and the family’s old house at number 3, it is not hard to imagine a portrait of the artist as a young man living in this neighborhood, with its narrow streets just one block away from the water. La Plata itself is stubbornly traditional in that it’s served the same four food items since it opened: fried sardines, Catalan sausage, tomato salad with onions and anchovies. 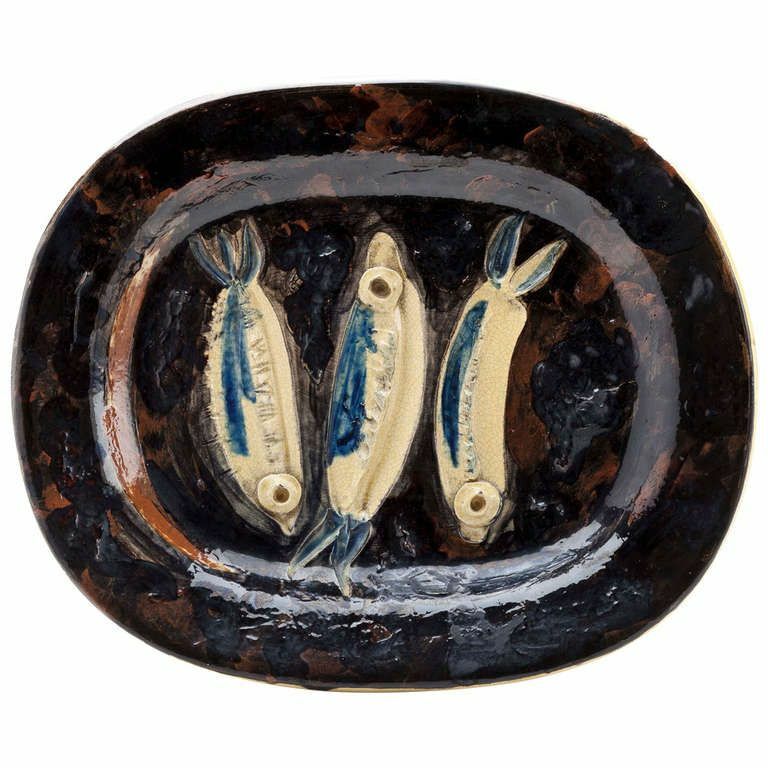 If you have seen any of the ceramics from Picasso’s later life, like the “Three Sardines” (1948), ordering a plate of tapas here can feel like you’re being served a dish straight from the artist’s inspiration.